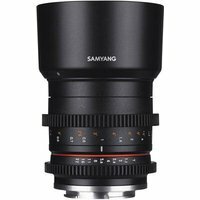 Designed for professional follow focus systems, thanks to the quiet and smooth de-clicked focus and aperture gear rings, the Samyang 50mm T1.3 AS UMS CS lens has been optimised for video use. Also, the distance scale and T numbers are marked on both sides of the lens for convenience when filming. Great for portraits and everyday snapping thanks to its impressive T1.3 aperture, the lens creates bright images with beautiful bokeh, even under restrictive lighting conditions.